Wow! Mandanna's debut novel has to be the best book I've read this year. No, I take that back. It has to be the best book I've read in a really long time. I love it. In fact, I loved it a lot more than I thought I would. The concept of echoes was different. It was a much more complex and fascinating process than the typical cloning. And while Mandanna doesn't go as in-depth into the process of creating echoes as I would have liked, she does tell you enough. It's enough to be intrigued and curious, but also somewhat hesitant. There's a fear of the unknown that makes it all the better. The book was just fantastic. The writing was beautifully done. Mandanna's writing is powerful and full of emotion. The characters were real. I understood every character and how their behavior fit them. While I might not have agreed with a character, I understood them (even the Weavers). I feel like that's an important part of characters. The plot was fantastic. I really don't think there's enough good things I could possibly say. 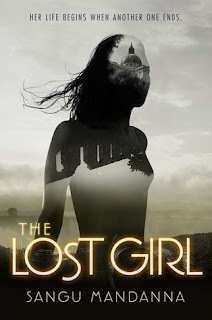 I know many people would like a sequel to The Lost Girl, but I personally hope this stays a stand-alone book. I think, while not perfect, the ending was nicely done. I like it being as open to interpretation as it is. Yes, it would have been nice to have a definite answer as to what happens, but sometimes it's good to leave it to the imagination. In case it isn't obvious, I recommend The Lost Girl to anyone that hasn't already read it . And I look forward to Sangu Mandanna's next book. Sounds like a good read, can't wait to find the time to pick it up sometime.